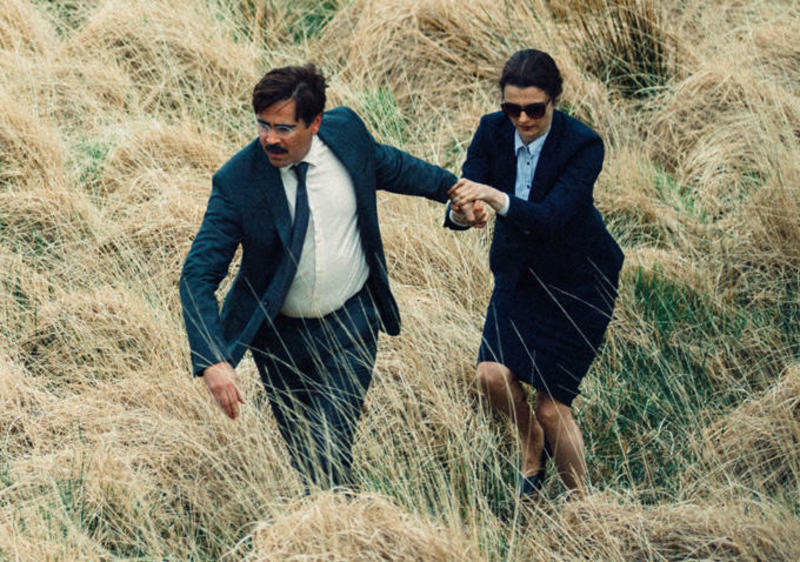 I had a great time at "The Lobster" and it also sort of made me want to kill myself. I am pretty sure this is the reaction the filmmakers were looking for. Yorgos Lanthimos, the Greek filmmaker whose last movie to get a wide release in the US was "Dogtooth," directed it. He also co-wrote it (with Efthymis Philippou). It's one of those films with such an unusual premise that when you describe it to other people, you start to wonder if you actually saw it or if it was a dream you had about a work that doesn't actually exist. Colin Farrell (and his potbelly and glasses) star as the film's borderline-hapless hero, David, who gets dumped by his wife in the opening scene. This is very bad news, because in David's society, being single is punishable by transformation into an animal. The person being transformed get to choose the animal (David picks the lobster for some reason) but it's cold comfort. We're talking forced reincarnation, essentially, with a "thin the herd" subtext that at times makes the movie feel a bit like the Noah Baumbach version of "Children of Men," or maybe the schlub's edition of "Logan's Run," a movie set in a society where anyone over thirty gets put to death. David's sentence is probationary, though. If he hooks up with somebody, he might be able to go on living. Single people get shipped off to a resort for singles. They have 45 days to find a mate. Anyone without a mate gets transformed. Anyone who does find a mate gets shipped out to the yachts anchored on the lake nearby, to "work on their relationship," or somesuch. If there are any problems communicating, the authorities will assign them a child. The characters are rarely given names; the movie's credits tend to define them by their plot function or by whatever their most vivid characteristic happens to be. Ben Whishaw and John C. Reilly play, respectively, Limping Man and Lisping Man. Limping Man falls for another guest, Nosebleed Woman (Jessica Barden), who habitually bleeds on her own clothes and others', and tries to convince her that they are compatible by secretly bashing his own nose against tabletops to make it bleed, too. This sort of thing happens a lot at the resort: lying to get a mate. That it happens in life, too, is not lost on the filmmakers. Satire exaggerates verifiable or assumed tendencies in life; here it's about the way that single people are made to feel incomplete, worthless, even inhuman by a society that defines the child-producing heterosexual union above any other configuration. "Now the fact that you will turn into an animal if you fail to fall in love with someone during your stay here is not something that should upset you or get you down," a hotel manager tells David and other guests. "Just think, as an animal you'll have a second chance to find a companion. But, even then, you must be careful; you need to choose a companion that is a similar type of animal to you. A wolf and a penguin could never live together, nor could a camel and a hippopotamus. That would be absurd." But the ostracizing of single people is not the only thing "The Lobster" is about. I don't know exactly why I believe that, because the movie is mysterious in its intent and deliberately inexact in its messages, but you'll know what I mean as you watch it. There is a touch of "The Twilight Zone" to the premise, but also splashes of Kafka-esque parable and also magical realism. (Julio Cortazar's short fiction often dealt in similar scenarios.) David and all of the other characters must make choices in a society where a particular value or situation ("true love," or the permanent union of a couple) is treated as the prism through which all other decisions and situations must be defined. This is a form of fanaticism. We could just as easily be watching a film set in a fascist or communist or laissez-faire capitalist society, where the most important thing is proving that you value the thing that everyone else in the society claims to value, even if it doesn't make any intellectual or emotional sense, because if you say you don't value that thing—or that you value your autonomy more than getting the state's seal of approval—you could be turned into a llama or a dog or a lizard or whatever animal you named in your entrance interview at the singles resort. People who are content to be single are treated as not fully human, thus the ease with which they can be arrested, imprisoned, shot, transformed into animals, etc. "It's no coincidence that the targets are shaped like single people and not couples," says a trainer at a dart rifle range, just before a people-hunt. As you've gathered, the movie is a satirical comedy—at times a very funny one, and other times the kind that makes you cover your eyes because what's happening onscreen is brutal, humiliating, or just unsettling in a way you can't quite place. Sometimes the movie is not funny at all and clearly isn't trying to be, and at several key moments it's deeply horrifying. The director's last film, "Dogtooth," was more or less done in this same vein. It's a satire about a cult-like family that raised its children in an enclosed compound and warned them that they couldn't leave until they lost a dogtooth; there was no television, no radio, no outside news of any kind allowed in the compound, only an invented mythology plus some old VHS cassettes of Hollywood films (including "Flashdance") that one of the daughters had secretly become obsessed with. There is a scene in "Dogtooth" where the patriarch of the family tried to reinforce his children's fear of the outside world by playing them Frank Sinatra's version of "Fly Me To the Moon" on vinyl and interpreting the lyrics: "Dad loves us. Mom loves us. Do we love them? Yes, we love them." I mention all this so you know what you're getting yourself into when you see "The Lobster." The humor and the tone are so odd that they bear very little relation to anything else in movies right now. You can compare the premise to various sci-fi films or to particular schools of literary fiction, as I did higher up in this piece, but the look and rhythm and tone are so unique that the movie ultimately defies any attempt to pigeonhole it. Like "Dogtooth," which I also liked a lot despite whatever flaws I believed I could identify, this one is a good argument in favor of the featurette -- a cinematic story that's somewhere between 45 minutes to an hour long. The movie feels tight and focused as long as we're in the resort, watching David getting history's saddest lap dance from an employee, or asking Nosebleed Woman to dance and ending up with red drops on his white dress shirt, or sitting awkwardly beside Biscuit Woman (Ashley Jensen) on a bus and listening as she desperately propositions him, or trying to ingratiate himself with the aptly named Heartless Woman (Angeliki Papoulia) by pretending to be heartless as well. But as soon as it moves out into the woods, where David meets our third-person narrator, Short Sighted Woman (Rachel Weisz), and Loner Leader (Lea Seydoux), the head of some sort of revolutionary group that lives out in the woods and plots to terrorize the authorities, the movie loses its momentum and sense of direction, and you can feel a bit of strain settling in. But "The Lobster" is so distinctively Lanthimosian (yes, I have decided that is a word now) that I was always grateful for the film's existence even when its situations dragged or its extreme brutality disturbed. There aren't many comic filmmakers you could identify within a few minutes, just by studying the characters' dialogue, the actors' performances and the way the movie photographs its situations. Lanthimos is that kind of comic filmmaker. I like his work so much that it's OK that sometimes I don't like it. I don't even hold it against him that I'm writing this piece at 3:15 a.m instead of sleeping because I saw his movie. Next Article: Norman Lear: Just Another Version of You Previous Article: 30 Minutes on: "They Live"